They're accomplishing two things I like with these posters (this one is more obvious than the billboards I've seen in my neighbourhood)—they're evoking comics, and they're evoking Japan. 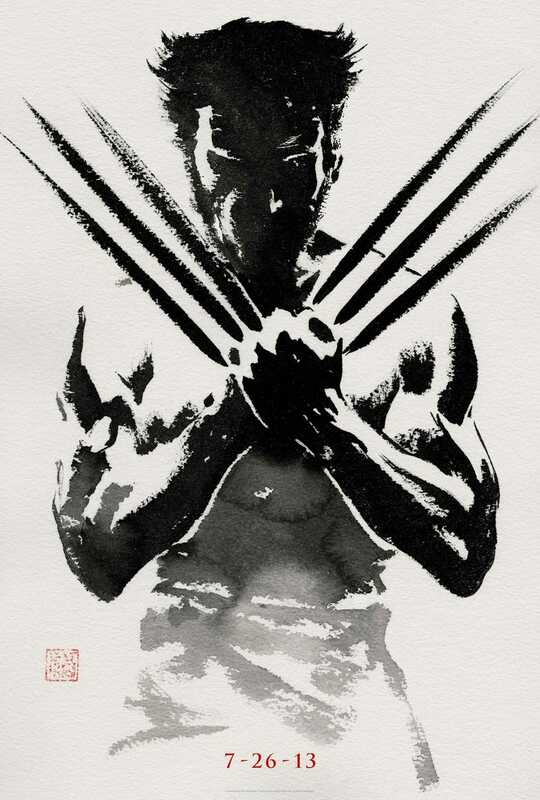 Casual viewers may not care very much about the inclusion of Japan, but for comics fans, this conjures up many distinct memories—Wolverine as samurai, Wolverine and Mariko, Itsu and Daken, Yukio, etc, as well as looser pan-Asian associations like Madripoor. I also think not using Jackman's clear image is interesting—I think he's a contender for best comic casting, not least of all because of how many people just go with the fact he's a foot too tall for the beserker they fell in love with. He's been Logan in, what, five films now? This the sixth? Pretty impressive, and he's got the fanbase (including his wife, lucky wench) to prove it. But they're not harping on that for this poster. Is that because it's only a teaser? Because he's a gimme? Trying to not conjure up memories of the first Wolverine movie? Not sure. But Jackman keeps increasing his popularity, and they're not cashing in on that yet.